The implementation of a HUD (Heads-Up Display) is nothing new, having been featured on GM cars as early as 1989. They’ve been in everything from a GMC Acadia, to a Buick Park Avenue (I used to own one), and now a full-color one in the refreshed 2014 ZL1 Camaro. No matter the vehicle surrounding the HUD, it’s a great feature, keeping your eyes on the road, and not on your lower dashboard, or iPhone. So what makes this new HUD so special? First off, as you turn the key to your insane 580 hp beast, there’s a traditional chrome-surrounded Chevy bowtie that appears on the windshield. Once that disappears, a more mundane green overlay speedometer makes it’s way in front of you, much like other GM cars with heads-up display. If you choose to switch over to the tachometer setting, a tricolor display ensues, bringing things more into the 21st century. This new display is a nice added touch for the slight refresh in the Camaro‘s 2014 model year, before the next generation is to be sold. If this sort of improvement is seen towards the end of this generation, we can only assume that even greater improvements will be made for the future. 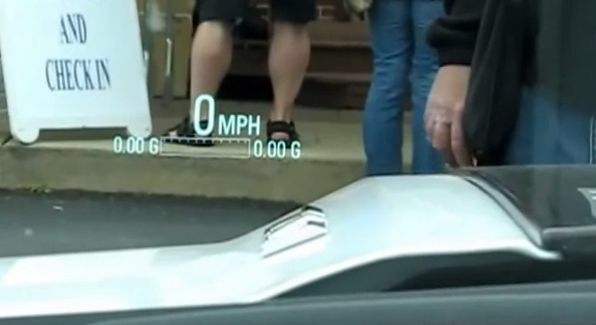 But the 2014 Z/28 won’t get a HUD. Becuase HUD units just aren’t hard-core enough. I would take a ZL1 in a heartbeat. But, unfortunately, there’s no way I can afford it. I’m not sure what use a full-color HUD is—other than the “whiz-bang” factor, but hey, I’m game! I have owned several HUD cars and love the system. My wife also loves it too. To me it is one of the best safety features ever as you never have to take your eyes off the road. GM really should consider making this a company wide feature. I never got the gimmick thinking of this system as most people who say this never spent more than a dew mins with the systems. The ATS was great in full color too. The only negative is I can not wear Polarized sun glasses with the system as it make it dim or vanish. After picking up my Camaro with HUD, i’d love to have it on any vehicle especially with the tach for manual transmissions. I agree that it should be company wide, as well as it being a great safety feature. Being able to keep eyes on the road as well as knowing your speed and rpm is very useful. I have owned several Pontiac GTPs with the HUD systems, driving them for many thousands of miles, under all conditions of Michigan weather and traffic. It is a great feature, but there are times when it is distracting, whence I turn it “off”. My suggestion is to have the turn signal indicators, but not the headlight high-beam indicator, projected via HUD even when the other displays are turned “off”. Perhaps engine over-temperature, low oil pressure, and alternator malfunction warnings should be done that way, too. 1998 Pontiacs had that…this isn`t new…but it is needed. Gm may not putt HUD in the 2014 Z/28 but i will add it.